DURING THE RISE AND FALL OF TPLF VIGILANTE ETHNIC RULE - EVEN DONKEYS WERE SENT TO THE SLAUGHTER HOUSE—DELUSIONAL ATHEISTS. I call the dethroned TPLF leaders delusionalists because they implemented vigilante ethnic politics during their reign, they ruled Ethiopia along ethnic lines and posed the greatest threat to Ethiopia's unity, they dreamed in a vacuum, to set up Greater Republic of Tigray. When Tigray cannot even survive for a month without the rest of Ethiopia, they allowed thousands of Donkeys to go to slaughter house for human consumption. The TPLF also expelled Eritreans because of the colour of their eyes and crossed Mereb river (that separates Eritrea from Ethiopia) to dismember the very nation that helped them to come to power – Eritrea; all of this leads me to the conclusion that they are delusional atheists (being so ungodly as to kill donkeys and sell their meat, an animal pivotal to many farmers survival. How did all of these come about? When Mengistu Hailemariam came to power in Ethiopia in 1974, he ruled the country by the sword. After 17 years of his torturous rule, he had to run for his life when he was threatened by the sword. His army, the biggest in Africa, was completely defeated at the hands of the Eritrean Peoples Liberation Front (EPLF) in May 1991 and there were no Ethiopian combat forces left inside Eritrea then. Immediately afterwards Eritrean forces moved swiftly to assist the Tigrean Peoples Liberation Front (TPLF) who were fighting the regime in Ethiopia. The two forces lead by the military genius of the EPLF coordinated their military tactics and marched towards Addis Abbaba for a mop up operation to clear the remnants of the regime. For the Ethiopian dictator, the writing was on the wall, he decided to cut and run, fleeing the country, emptying the treasury in Ethiopia and was then given refuge in Zimbabwe by the deposed Zimbabwean leader - Robert Mugabe. So the fall of the regime opened new chapter in Ethiopian history where the TPLF rose to power . (1) THE RISE AND FALL OF TPLF REGIME: It should be remembered that when the TPLF regime came to power in in 1991, the people of Ethiopia welcomed them with joy happiness; the people of Eritrea supported them with their Tank brigades rolling through the heart of Addis Ababa to help them occupy said city, the crown Jewel of Ethiopia, deposing the criminal regime of M. Hailemariam. Little did we know that four years later, in 1995, the snakes in the grass (the TPLF regime) having mastered the intrigues of politics, strengthening themselves with power, money and military might then placed their lieutenants in key positions. Using their cynical policy of divide and rule, utilizing their delusional ethnic administration with the stated aim of reducing conflicts and equalize different communities in Ethiopia. In reality however, they partitioned Ethiopia along ethnic lines and the phrase “ethnic administration” became the slogan of the leadership. Convincing themselves and their circles, believing their own propaganda, they left no stone unturned to stay in power for decades, while ignoring the long term consequence of ethnic administration. To make sure that they ruled unchallenged, to make sure that they were feared by the public, they went the extra mile, introducing what I call “vigilante politics” to help them achieve their ultimate goal, to divide Ethiopia along tribal lines. (2) BUT WHAT IS VIGILANTE POLITICS? Vigilante politics is a mob rule, enhanced by the TPLF to make them untouchable, it was organized mob rule, created outside legitimate channels to suppress or eradicate any threat to their status quo, they preached to people about the bogey men/women next door with the sole aim of sowing fear. It was followed by sheer terror, suppression, international kidnapping, embezzlement and money laundering to get Ethiopia into a strangle hold along ethnic lines. When it comes to Eritrea, the TPLFs vigilante politics against Eritrea was accompanied by sabre rattling (an aggressive behaviour) in which threats were made often of military action, threat of war, regime change, diplomatic isolation , 9 years of sanction and genocide in order to satisfy their desire in setting up the Republic of Tigrai - was completely delusional. If the people of Ethiopia had known the ruling party were to introduce ethnic administration - it would have been rejected. If the people of Eritrea had known the TPLF would divide Ethiopia on tribal lines and turn their guns on the very people who carried them by their shoulders to power (Eritrea)- it would have been rejected. We need to remember - in 1975, the Eritrean leadership rejected the secessionist ethnic ideology of TPLF s dream of “Greater Tigrai”. In any case, to achieve the above mentioned points, “Vigilante politics” was used as a vehicle to terrify the whole population; they used brute force, to subdue the public for decades and the EPRDF (a collection of four organizations under the TPLF regime) has been a willing partner to the implementation of the strategy carried out by them. Thus, TPLF Vigilante politics was another tool purposely tailored to suit their policy in order to be aggressive, cruel and destructive; many crimes against humanity took place during their reign. What was surprising was that, when Vigilante politics was in full gear, the outside world closed its eyes, governments around the world danced to their tune, accepting it as legitimate as their interest was served by the regime. Paid lobbyists and Journalists, who advocated on their behalf, actively told the outside world that the regime in Ethiopia is democratic. Moreover, the three previous American administrations turned a blind eye, from the Bush dynasty all the way to the dying days of the Obama administration with his Neo-Con Secretary of state Hillary Clinton who had hawkish warmongering foreign policy supported them blindly. Susan Rise, former US Ambassador to the UN and personal friend of Meles Zenawi was asked about the 2010 election in Ethiopia; she said the election in Ethiopia was democratic, knowing full well it was rigged. What she was doing was covering up for the regime. She also did everything she could to support the vigilante politics of the regime and keep her comrades in power. In a way she also made herself victim of the vigilante politics by unsightly supporting her friends while making herself a laughing stock of International politics. It was clear for everyone to see that the election in Ethiopia was not free and fair, she knew it was a sham. Yet she whole-heartedly supported their vigilante politics, even when they were committing crimes against humanity--it was a political blunder. TPLF regime also had foreign lobbyists like British Journalist Martin Plaut, who has always supported their policy, even when they were doing wrong, while spreading fake news about Eritrea to create confusion amongst Eritreans. Needless to say, politicians and journalists were themselves sucked into espousing vigilante politics to help their friends in Ethiopia and urged the outside world to support the narrative of the TPLF regime. Unconcerned by the vigilante politics of the regime in Ethiopia, the European Union also followed suit as it furthered their interests in the region. It is no secret that the late Ethiopian premier Meles Zenawi and his successors have been dancing to their liking. Note also, the mass media as we know it did not care about truth, while they played vigilante politics, the information the minority government provided them was acknowledged without any scrutiny. Hence Vigilante politics played pivotal role as they carried out their wicked policy of Ethnic administration in full gear, rolled out all over the country unhindered. That is how the TPLF regime survived in power for almost three decades, using vigilante politics accompanied by manufacturing data, misinformation, tailored rules to its advantage in order to fool the people of Ethiopia. (3) SO WITH VIGILANTE POLITCS CLEARING THE WAY FOR ETHNIC RULE, WHAT IS ETHNICITY? Ethnicity is based on ancestry, language, history, society, culture, ideology, nation or inherited status based on the society in which one lives. Ethnicity may also radicalise people into committing ethnic cleansing, which the regime in Ethiopia is guilty of. Lets have a look at some of the ethnic cleansing that happen around the world. Many African countries see ethnic administration as the cause of all evils that has led nations to violence and ethnic cleansing, as happen in Rwanda in 1994 when nearly one million of the Tutsi minority, were slaughtered by the Hutu majority and their bodies were thrown into rivers. While their killers were mocking the dead bodies of the Tutsi’s, saying they were being sent back to their country. Similarly, ethnic conflict has occurred in Kenya in the early 1990s and between 2007-8, between the Kikuyu Majority and Kalengins, the second largest community in the country. It has also occurred in Myanmar in August 2017, the Myanmar government drove out nearly 750,000 Rohingya Muslims, they fled to Bangladesh where they originated from though they have lived for more than 50 years in Myanmar. Governing along ethnic lines is very divisive, instead of believing in shared values, ethnic rule has lead to seclusion, the ruling ethnicity believes only in their own ethnic group rather than in shared values. As in the case of the TPLF rule in Ethiopia, it undermined Ethiopian nationalism and unity and many people were cleansed (killed) or displaced by the regime from their ancestoral land. The TPLF leadership running Ethiopia ethnically cleansed about 80,000 Eritreans who lived there peacefully for more than 50 years, contributing towards Ethiopia’s economy; they were inhumanly expelled from Ethiopia due to their ethnicity during the border conflict between Eritrea and Ethiopia in 1998. In addition, using its own deceptive blueprint, the TPLF leadership in Ethiopia replaced national institutions by ethnic institutions, the federal system of government they adopted was imposed from above, the policy making process remained solely in their own hands, ethnic leaders were chosen by the ruling elites and did not have the freedom to help the people they were meant to govern, regional development had to be approved by the TPLF leaders. The two largest ethnic groups, the Oromos and Amharas, were excluded from playing a key role in the destiny of their nation. Whilst the other small ethnic groups were left outside of the Ethiopian political process, the Tigrayan elites had the power to hire and fire at a stroke, making themselves the untouchable Kings of Ethiopia until--- their dying days. So with complete power in their hands they managed to control the population like a heard of cattle. With radio, television, newspapers and the internet at their disposal, they were able to disseminate false information and created walls of division among the people of Ethiopia and Eritrea. They created a state with in a state by polarizing the politics of Ethiopia and behaving like colonial masters – having one separate rules for the Governors and another set of rules for the governed. Instead of relying in common-sense and majority view, they ruled as if they had a God given right. The philosophy behind ethnic rule was unsophisticated - while giving the impression it was good for the rest country it benefited TPLF elites and their activists. Unruffled by the foot prints their ethnic legacy will leave behind, they soldiered on regardless, expropriating fertile lands from neighbouring regions, they moved Ethiopian armaments to Tigrai, wanted to invade Eritrea and destroy her so that her coastal areas can be added to the Tigrai region and then trigger article 39 to cede from Ethiopia to create the Greater Republic of Tigrai. Note, while article 39 of the Ethiopian constitution allows regions to self determination, the TPLF strategy was rhetorical rather than practical because the ruling party had no intention to allow other regions to leave Ethiopia. In short article 39 was invented to benefit Tigrai, not to any other regions of Ethiopia. This was a political fantasy, believing that Tigrai can live without Ethiopia, this is delusional and a complete blunder. What needs to be understood here is that Tigrai does not have the resources to live by herself, it does not have the access to sea port, it does not posses the black gold, and no investor would come to invest in Tigrai. The dream of a Greater Tigrai, as an independent country, is delusional. Tigrai is a prisoner of its own geography and can not survive on its own, yet TPLF dreamers refused to understand such a logic because they have been living in cloud cuckoo land. In short “Ethiopia can live with out Tigrai, but Tigrai can not live without Ethiopia even for a month - the remnants of the TPLF regime had been living in a state of denial. It should also be said that buoyed with money and power, the TPLF ethnic administration went on spending spree for two decades, initiating huge infrastructure in the country, borrowing and spending money like there was no tomorrow, which has left the country in huge debt that it may not be able to pay back and could be held to ransom by creditor countries like China who may force the government to provide China a share in Ethiopian airlines or other lucrative enterprises. There is no doubt TPLF regime spent billions on infrastructure projects like the Djibouti-Addis railway line and the Renaissance dam while embezzling billions of dollars to benefit their elite ethnic group. What they should have done was first carry out cost benefit analysis or feasibility studies and determine whether the project would benefit the public. It should be remembered that first and foremost, TPLF's intention was always to benefit themselves and their supporters. For instance, the Endowment Fund For the Rehabilitation of Tigray (EFFORT) was created to control Ethiopia’s resources so they could enrich themselves while ignoring the rest of the population including the majority people of Tigrai who did not benefit from TPLF rule. At the end of the day, if money borrowed is not invested wisely, it could turn into permanent debt. The TPLF leaders did not understand the golden rule of financial discipline, DO NOT SPEND MONEY YOU DO NOT HAVE, otherwise the debt will cause the creditor countries and banks to hover over your head like vultures and once you default, they will come back and ask for their money, or they may take back the project they created for you. For the TPLF leadership however, taking advantage of debt and development through out the years in Ethiopia was seen as a bonus and they expected to rule Ethiopia for ever. As time went by these guys became drunk with power, controlling everything under their tightly closed ethnic group the Tigreians, becoming short sighted, naive without any strategic vision for the future of Ethiopia. Perhaps the following phrase would summarize TPLF rule in Ethiopia:“to a person holding a hammer, everything looks like a nail”. 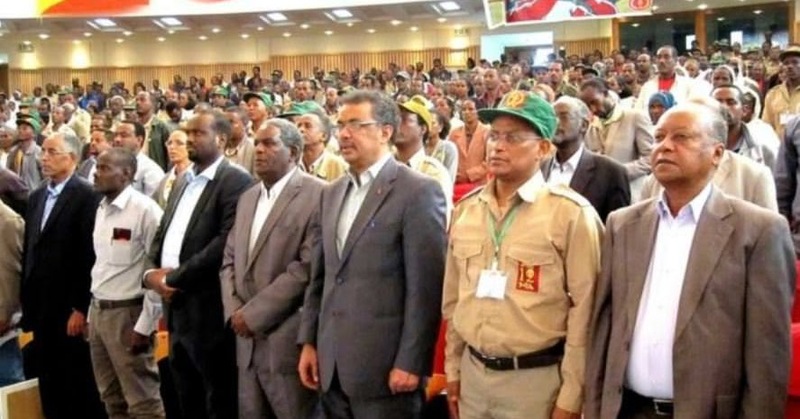 For the top TPLF brass, every person, property, journalist and opposition group, looked to them like a nail and they kept on hammering everything that stands in their way. Even the humble donkeys of Ethiopia, the life lines of Ethiopian farmers, were not spared from their cruel rule as they were slaughtered in their thousands for human consumption, decimating their population. (4) THAT IS WHY I CALL THE TPLF LEADERSHIP DELUSIONAL ATHEISTS BECAUSE THIS IS THE FIRST TIME IN ETHIOPIAN HISORTY THAT DONKEYS WERE SENT TO THE SLAUGHTER HOUSE? : How shocking, even donkeys have became victims of the regime as they were sent in their thousands to a slaughter house for human consumption. Frankly, it was disgraceful, completely unethical and scandalous for the majority to hear that donkeys were used for human consumption in Ethiopia. This is proof of how ruthless the regime was, it did everything it could to make money, even killing donkeys. The story of donkey business was hidden from the Ethiopian public for fear of a backlash. The TPLF leaders allowed the donkeys to be slaughtered in certain parts of Ethiopia but not in their beloved region of Tigrai. According to the news website Ethiopian Observatory, between 100- 200 donkeys were sent to slaughter house in Debrezeiti every day for human consumption regardless of rights or wrongs in killing donkeys. Why is this happening? The reason was that there are about 60-80,000 Chinese people now living in Ethiopia, for them, donkey meat is a delicacy. The Weyanes unethically collaborated with the Chinese investors and allowed the Chinese population in Ethiopia to open slaughter houses for donkeys. So far the biggest donkey slaughter house is in Debrezeiti, another is in Asela and was still under construction by Chinese investors and has probably opened for business by now. The Chinese owned Debrezait slaughter house provides the Chinese population in Ethiopia with a delicacy and any excess donkey meat is shipped to China. What is completely disheartening is the TPLF leaders involvement in donkey business. Honestly, it was quite abhorrent to slaughter donkeys who are the life line of many farmers in Ethiopia, it is simply sinful and trouble some. Putting to death donkeys for food is simple against the values and culture of the people of Ethiopia and the rest of the world. It is simply beyond belief. One may ask, since the donkey meat is expanding in Ethiopia, how does any one know if meat sold as a beef is donkey meat? Could the Tigrean leadership have been enjoying the donkey meat themselves or selling them disguised as beef? Who knows? This is a classic example of how the dethroned TPLF regime had little respect for the law or for farmers who are now in constant fear that their main method of transporting people or goods, may be stolen at any time and sent to slaughterhouse. Ethiopia is a God /Allah fearing nation but the cruelty of the Weyanes ethnic rule was there for every one to see. One can also describe the TPLF ethnic rulers as Delusional Atheists who do not have any religion or any moral integrity, cashing in from dead donkeys is complete bizarre. (5) FINALLY: WHAT GOES UP MUST COME DOWN: After their defeat at the hands of the new Ethiopian premier, the political dream of the TPLF leadership to stay in power has evaportaed. The people of Ethiopia have said enough is enough to the TPLF leaders who have overstayed their welcome. The reason was uncomplicated, the mighty forces of the discontented, the forces of the have nots vigorously protested against the cruel rule of the vigilante ethnic politics of the regime, creating a Tsunami of anger bringing TPLF’s ethnic rule to an an abrupt end. At the time even the humble donkeys of Ethiopia joined forces to rally behind the people of Ethiopia for the regime to die and die fast, bringing 27 years of ethnic rule to an end by 27 days of resistance, sending shivers down the spines of the TPLF warlords, forcing them to escape with their last parachute and head to their hide out in Mekele as their dancing days are over forever. Follow this link https://youtu.be/6_7ul3PBp34 to see a video of the former Eritrean defence minister, Sebhat Efrem, who fought the TPLF regime. In the video he says that the revolution led by the TPLF, stretched like rubber band and now the rubber band has retreated back to Mekele leaving a trail of destruction in its wake. Meanwhile the choices the TPLF remnants have, at present, is very narrow. They can either accept the change brought by the people of Ethiopia, led by the new Ethiopian premier, or risk losing everything they have gained over the years. There is no alternative, Dr Debrezion (the Crocodile) his spy chief Getachew Assefa and other collaborates are now living on borrowed time hiding in Mekele but the message is quite loud and clear – accept the change or perish. The clock is ticking, time is running out, the Sun is going down, money will run out soon - so the ball is entirely in their court. Even if they remain hidden in a the tunnels of Tigrai or in Mekele, they are dead wrong. They will be hunted down, dug out from their tunnels as Saddam Hussein was dug out from a tunnel in his birth place of Tikrit Iraq (note the Iraq war was an illegal war). Therefore, the message for the remnants of the TPLF leadership is, the net is closing fast on you guys, this is your last chance to save your selves and the humble people of Tigrai. You may think the game is not over yet, you are dead wrong, you have miscalculated before, do not repeat it again. The situation now is different, it is dead serious, you don’t know what is awaiting you, you are going to be defeated comprehensively, physically, financially so badly that you may never recover in future. You can not hide as there is no where to run because the people of Ethiopia, with their Oromo (unifying) king and his deputy supported by their Federal Army are coming to get you! Next article to follow: The Kings of Tigray (TPLF ELITE) are almost dead, long live the unifying Oromo King and his deputy.